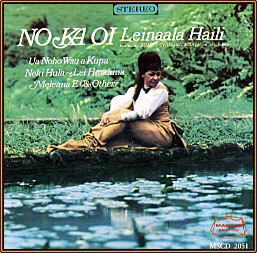 LEINA'ALA'S first albums proved again that good things come in threes. But this, her fourth recording, is better than a good thing. It is, as the title just had to say, the very best of all. And it is only what might be expected of an artist who enjoys a special and enthusiastic aloha from just about everyone in the Islands ... whether they are here for good or for good fun. What is expected even now, however, is that anyone can get Lei to stand still long enough to make records, since she is, as usual, running in at least half a dozen directions at once. Not that she actually ever seems to stand still. Hawaiian style, she will almost always dance along with every song ... adding, with hula, a visual dimension to the vocal picture. It is a very good thing that her busy lifestyle never seems too much for her, because none of the rest of us ever seem to hear too much of her. No such thing ... because Leina'ala herself is just too much.